(CNN) -- Manchester United supremo Alex Ferguson admits he will be "slaughtered" if the unfamiliar team he fields in Sunday's final domestic game hands opponents Hull City a Premier League lifeline. United boss Ferguson is backing his squad players to beat Hull in the final round of Premier League matches. Ferguson, who wants to protect his stars before Wednesday's Champions League final against Barcelona, reckons it is time officials scrapped the rule which is supposed to force managers to play their best team in every game. The regulation is the reason Middlesbrough, Sunderland and Newcastle could take legal action against champions United for the team they will field at Hull on Sunday when the relegation dogfight reaches a climax. England defender Rio Ferdinand, sidelined for three games with a calf injury, is the only player expected to feature at Hull who could also be in the starting side for the midweek match in Rome. 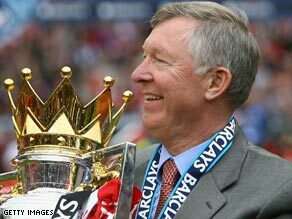 Ferguson has tried to allay fears of a below-par United performance at the KC Stadium, but admitted in the Daily Telegraph: "Our responsibility is to win the European Cup and everyone is aware of that. That is why we are talking about changes. "My players wouldn't forgive me if I played the strongest team on Sunday. They would say 'what?' That would be the best thing that could happen to Hull really. They would relish that. Would my players be tiptoeing around? It's possible." But the United boss accepted: "If we don't win on Sunday , I will be slaughtered on Monday. It will be the worst thing that has ever happened to the British game and people will be complaining about me damaging the integrity of our league." Such a selection stance would appear to flout Premier League rules. However, given the squad systems now in operation, Ferguson does not feel it is an effective law anyway. "It has never been practical for years now," said the Scot. "Richard Scudamore has more or less said that -- and he is chief executive of the Premier League, so he is speaking from a position of authority. No one criticised the United chief when he included Ben Foster and Federico Macheda in a team that won at Middlesbrough at the beginning of the month. "If you look at my squad now the number of games they have all played is evenly spread out. Jonny Evans has played around 37 games, which is fantastic for us and for him because he gets experience. "Once you have a large squad, unless you utilise it, you are going to lose players anyway because they will want to move on to somewhere where they are going to make some contribution."